CityHost Review 2019: Is CityHost a Good Hosting? CityHost has been providing website hosting with SSD storage since 2005. The plans are affordable, but beginners may struggle with a couple of features. CityHost uses SSD storage which should mean much faster disk read/write times than regular HDD, and even better, they are in RAID 10 configuration to mitigate the risk of data loss in the event of a disk failure. This way you can ensure your data is loaded quickly, and depending on your (or your customers’) location, you can select servers located in either German or Ukrainian data centers. Plus, the uptime guarantee is 99.9%, although I can’t find a corresponding SLA on the website. All of the plans come with support for PHP, Python, and Perl, and it’s nice to see that all versions from twice as slow 5 through to 7.2 are included. The usual features like MySQL databases and phpMyAdmin, are included, as well as SSH access and Cron jobs to ensure your website runs smoothly. The control panel is proprietary to CityHost, so that’s not ideal if you’d like a well-known provider like cPanel or Plesk, however, the equipment is branded Dell, HP, Cisco, Intel, Supermicro, and so on. For beginners, there’s a one-click installer (although it requires some technical knowledge to install it) and also a “simple” website building tool. The prices are low compared to lots of other similar companies. You even get a significant discount if you purchase a longer-term upfront – the terms range from one month to two years. There’s a free SSL certificate included in all plans, but you do need to purchase a domain name. Or alternatively, if you purchase a domain name, you get three months hosting free. It’s also great to see a free 10-day trial and generous 30-day money-back guarantee. Customer service is 24/7 by email, phone, and live chat. There are also quite a lot of FAQs and how-to guides on the website, which is useful if you don’t want to speak with support. 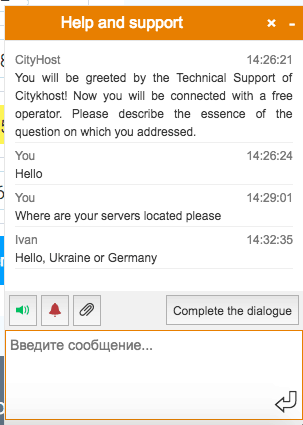 I did hop on live chat with the team a few times and found them to be helpful, polite, and happy to deal with me in English. It was clear the operator was well-informed and understood the product well. CityHost offers affordable hosting which is compatible with popular CMS programs and SSD storage. As well as being cheap, there’s support for advanced coding languages and a website building tool, but to add a one-click installer, you’ll need some technical knowledge. Wondering how CityHost stacks up against other Web Hosting companies? Enter any other Web Hosting company and we will give you a side-by-side comparison.